Emmitt Earl Thomas, born June 3, 1943 is currently the secondary coach of the National Football League's Kansas City Chiefs. He is a former college and professional football player who played for the American Football League's Kansas City Chiefs from 1966 to 1969, and then for the Chiefs in the NFL from 1970 to 1978. He owns the Chiefs all-time interception record with 58, which places him ninth on pro football's all-time list. 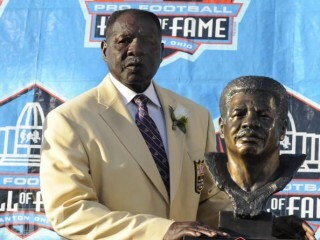 Thomas was elected to the NFL's Pro Football Hall of Fame after being nominated by the Seniors Committee. Thomas is the thirteenth Chief player elected to the Hall of Fame, joining (majority of career Hall of Famers) Len Dawson, Buck Buchanan, Bobby Bell, Willie Lanier, Jan Stenerud, Marcus Allen, Derrick Thomas, coach Hank Stram, founder/owner Lamar Hunt (minor portion of career Hall of Famers), Joe Montana, Warren Moon, Mike Webster, and coach Marv Levy. Emmitt Thomas returns to his football roots in Kansas City, entering his first season as the Chiefs defensive backs coach. Inducted into the Pro Football Hall of Fame in 2008 and the Chiefs Hall of Fame in ’86, Thomas played cornerback for 13 seasons with Kansas City (’66-78) and finished his career with a franchise-record 58 interceptions. Thomas enters his 30th season as an NFL assistant coach and his 43rd overall NFL campaign in 2010. He was a member of both of Kansas City’s Super Bowl squads, registering four INTs during the club’s postseason run in ’69 that culminated with a win in Super Bowl IV. He also owns a pair of Super Bowl rings working on Joe Gibbs’ staff with the Washington Redskins. Prior to re-joining the Chiefs, Thomas spent eight seasons coaching with the Atlanta Falcons (2002-09), including a stint as interim head coach for the final three games of the 2007 campaign. He owns seven seasons of NFL experience as a defensive coordinator, including a two-year tenure in that role with Minnesota (2000-01). The Vikings won the NFC Central and advanced to the NFC Championship Game during the 2000 season. Thomas held the same capacity with Green Bay (‘99), helping CB Mike McKenzie earn all-rookie accolades. He previously served as defensive coordinator for four seasons in Philadelphia (’95-98). In ’98, the Eagles defense led the NFL in pass defense (170.0 ypg) and was third in the league in sacks per pass attempt (8.6). Philadelphia finished fifth in the NFL in total defense in ’96 and fourth in ’95, advancing to the playoffs with a 10-6 mark in both of those years. Thomas spent nine seasons as an assistant coach with Washington (’86-94) where he coached two Pro Football Hall of Famers – CB Darrell Green and WR Art Monk. Thomas served as the secondary coach his final eight campaigns with the Redskins, helping Green earn three Pro Bowl berths. Thomas helped guide the Redskins to five playoff appearances, including wins in Super Bowl XXII and Super Bowl XXVI. He began his tenure with the club as receivers coach in ’86 when both Monk and WR Gary Clark earned Pro Bowl honors. The Angleton, Texas native began his NFL coaching career as the wide receivers/tight ends coach with the St. Louis Cardinals (’81-85). Under Thomas’ tutelage, WR Roy Green tied for the NFC lead with 78 receptions in ’83. He began his coaching career at Central Missouri State (’79-80). Thomas registered 58 INTs in 181 regular season games, the fourth-highest total in NFL history among pure cornerbacks. His 938 INT return yards are also a Chiefs record. He also produced five INT return TDs and seven fumble recoveries. He was named to the Pro Bowl or the AFL All-Star Game on five occasions and was a first-team All-Pro selection in ’74 when he led the NFL with 12 INTs. He won two AFL titles with the Chiefs and was a member of the club’s Super Bowl I squad, as well as the club’s team that claimed a victory in Super Bowl IV. Thomas joined the Chiefs as an undrafted free agent in ’66 from Bishop College, where he played quarterback and wide receiver. Education: Bishop College (B.S.). Born: Angleton, Texas. Family: Wife - Jacqui; Children - Derek and Dedra. Derek is an assistant basketball coach at the University of Detroit. View the full website biography of Emmitt Thomas.